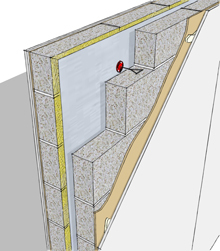 Following recent changes in the Building Regulation standards RMP Acoustic Consultants have been receiving an increasing number of requests for acoustic review of drawings and construction details during the detailed proposal stage. The potential project savings of acoustic problems identified and rectified early are significant compared to the costs of mitigation works. RMP Acoustic Consultants possess a wealth of experience checking separating details, flanking details, HVAC systems and room acoustic treatments. A range of software suites are available to provide detailed calculations across the array of acoustic concerns, be they associated with environmental noise control, sound insulation, industrial noise reduction , noise transmission or room acoustics. These same skills coupled with the measurement and assessment capabilities enable us to provide detailed effective solutions to noise problems. RMP solutions are bespoke, verifiable and efficient. RMP Acoustic Consultants use market leading proprietary modelling software as well as a host of in-house calculation suites. The following calculation and modelling programs are used.